One of the oldest wood crafts in the world, timber framing involves connecting heavy wood timbers with mortise and tenon joinery. Timber-framed structures have the elegance and handcrafted look of furniture, yet on a larger scale. Timber framing displays the beauty of natural wood while offering modern-day benefits including structural stability within the frame – for wide-open interior spaces – and energy efficiency. Hugh Lofting Timber Framing is one of only eight timber-framing professionals in Pennsylvania. We’ve been crafting timber-framed homes and buildings for four decades. Our services are flexible and customized for homeowners, architects, or contractors. From an initial conversation, as well as sketches, photos, or drawings provided to us, we can recommend strategies and styles of timber framing that best suit your needs and budget. Our years of experience enable us to arrive at the best design packages quickly and efficiently. Our design concepts include coordination of structural insulated panels (SIPs), tongue-and-groove decking, and steel connections. We’ll specify what you need, price it, integrate it into our shop drawings, for a seamless transition to delivery and installation. We design, fabricate, and pre-fit every frame in our shop to ensure there are no surprises on the job site. You can be assured that whether we are performing the installation ourselves or leaving it to your trusted crew, the timber frame raising will be smooth and successful. 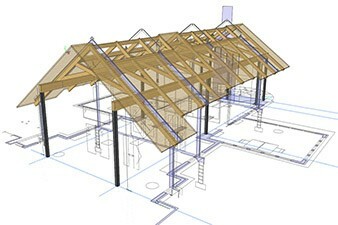 Our designers know how to integrate timber frames into the most complex buildings, and we combine the best computer design tools with our past experience to solve any challenge that may arise. Even when we are not engaged for construction, we provide complete assembly and raising instructions in advance and a site visit by one of our experienced supervisors before the raising day. Our dedication to our customers doesn’t stop when our scope is complete. We value your decision to use Hugh Lofting Timber Framing and we will be there to answer questions and offer advice long after our trucks pull away. After nearly 40 years in business, we have made many friends – and we keep in touch with them all. Homeowners – Whether you have just begun planning or are already working with an architect or builder, we can add value to the design team by offering recommendations that ensure a smooth pairing between our scope and the rest of your project. Give us a call or send us an email with more information about your project and we’ll let you know which of our services might be most appropriate for your needs. Architects – Our design department can interpret your schematic or construction documents and help you identify the specific timber frame strategies, specifications, and budget numbers to achieve your clients’ wishes. We can review drawings in almost any format, from printed plans to PDF files to 2D or 3D CAD drawings or BIM models. Give us a call or send us an email with more information and we’ll offer the expertise to integrate timber framing into your project. Contractors – Our structural timber frame design drawings can be imported seamlessly into your construction documents package. We are focused on clear communication, detailed assembly and raising instructions, and the support of our site supervisors to ensure construction runs smoothly. Give us a call or send us an email with more information and we’ll let you know how we fit into your project team.